Mobile app publishers have a number of app monetization tools at their disposal. Although a few app publishers still use the pay-to-download model, the freemium model has come to dominate the mobile app world. With the freemium model, an app uses advertising, in-app purchases or subscriptions to generate revenue. One of the best ways to understand the world of app monetization is to study how the largest app publishers make money today. In this blog post, we’ll look at 7 statistics that give us insight into app monetization. Sweet Pricing has performed a study of 40 popular mobile apps that have over 5 million downloads on the Google Play Store. All of the mobile apps are from different app publishers, and from 25 categories. 1 (2.5%) has more than 100 million downloads, 22 (55%) have between 10 million and 100 million downloads and 17 (42.5%) have between 5 million and 10 million downloads. User ratings range from 3.4 to 4.6, with an average rating of 4.1. Half the apps we studied are games. Of the 40 apps we studied, 26 (65%) use in-app advertising. So, at least for the largest mobile apps, advertising remains the commonest app monetization tool. Half of these apps, or 32.5% of all apps we studied, use advertising as their only source of in-app revenue. But the other half use in-app purchases alongside the ads. The nature of ads varies significantly from app to app. Players of mobile games often see video ads between levels of a game. It is also common for mobile games to reward gamers with free virtual currency for watching the ads. Apps that are not games are more likely to use banner advertising, displaying a simple text or graphical ad at the top or bottom of the screen. Other types of advertising, such as interactive ads containing (simulated) gameplay and interstitials, are used less often. 50% of mobile apps we studied use in-app purchases to generate revenue. As we observed in a previous blog post, analysts expect in-app purchases to be the dominant source of mobile app revenue in the next few years. So it’s no surprise that the largest app publishers are already using the app monetization tool. In-app purchases fall into three categories: consumables, non-consumables and subscriptions. A consumable is a product that a user pays for and consumes in-app, but which must be re-purchased to use a second time. It includes virtual currencies that users spend later for other in-app content. Non-consumables are products that an app permanently associates with a particular user, such as featuring unlocking products. And subscriptions are recurring payments to unlock features over time or access periodical content. In-app purchases, in general, monetize only a small proportion of an app’s user-base. It is not unusual for over 50% of in-app purchase revenue to come from less than 1% of users. But, in-app purchases can generate huge revenues, often far above the amount of revenue that advertising generates. That makes the model very attractive to many mobile app publishers. You might expect app publishers to use in-app purchases as an alternative to advertising. But, of the 20 apps we studied that use in-app purchases, 13 (65%) also feature in-app advertising. In fact, using both in-app purchases and advertising is the joint commonest app monetization mix. 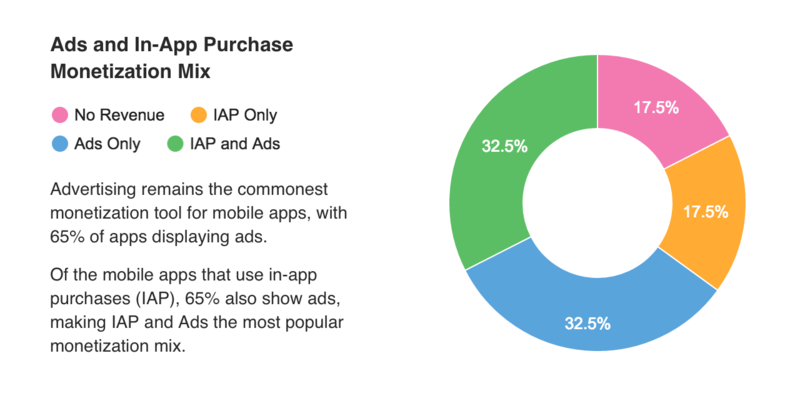 App publishers use the mix as often as they use advertising without in-app purchases. We made a similar observation in our study of freemium mobile games, and we noted that using both app monetization methods can ensure that app publishers monetize users who don’t buy in-app content. It was rather surprising to see that 15% of mobile apps are still using paid sister apps to make money. In this model, a mobile app publisher publishes two versions of their app: a free version and a paid version. The paid version contains all the functionality of the free version, but also contains extra functionality exclusive to paying customers. In large part, this app monetization strategy is a relic of the past. In-app purchases were available from 2009 on iPhone apps, but were not available until 2011 on Android. A small number of app publishers have not updated their apps to use in-app purchases, and still rely on the paid sister app model to make money. For the vast majority of apps, it does not make sense to use paid sister apps over in-app purchases. One common exception is the case of selling educational apps directly to schools which do not allow in-app purchases. Schools prefer bulk buying paid apps, often with a discount, so they can easily manage apps installed on their mobile or tablet systems. Of the 20 apps that use in-app purchases, half—or 25% of all apps studied—use one or more virtual currencies. Mobile games use virtual currencies as an intermediary store of value that allows gamers to buy consumable in-app products during gameplay. A virtual currency is a balance of ‘coins’ or ‘gold’ that gamers can exchange for in-app content. It is common for mobile games to use virtual currencies to sell consumable content during routine gameplay, and the app monetization tool will enhance gameplay if deployed in the right way. Games typically sell virtual currencies in various bundle sizes, offering users a substantial discount if they buy the larger bundles. Our previous study on virtual currencies showed that discounts ranged from 14% for the second-smallest bundle to 45% for the largest bundles that games sell. 60% of apps that use virtual currencies use just 1 virtual currency, with the remaining 40% using 2 or more. Many games offer both ‘coins’ and ‘gold’, where ‘coins’ are available during routine gameplay and ‘gold’ is available with in-app purchase, for example. In this model, gamers can still acquire virtual currency during routine gameplay, but they can also buy extra ‘gold’ to advance the game or get exclusive content. When combined with in-app advertising, a number of games reward gamers with virtual currency for watching video ads or performing other ‘positive actions’. There are a number of formats to this reward scheme, such as daily bonuses, currency for watching video ads and a reward every X minutes. This strategy can help keep users engaged with a game over the long term. 5% of the apps we studied use subscriptions for app monetization, making it the least common app monetization strategy. Apps can use subscriptions to unlock additional functionality or remove limits, allowing the user to pay only when they want the extra features. With high retention, subscriptions can generate large revenues for mobile app publishers, and are often favorable to ‘one-time payment’ upgrades. It is likely that subscriptions will become more popular in the future, since Google and Apple recently introduced better payment terms for subscription based apps. Google now takes 15% of subscription revenue, with Apple taking 15% after the first year. We expect these changes to encourage more app publishers to adopt a subscription revenue model. Apple recently removed restrictions on the categories that can use subscriptions, which could also see more mobile apps adopt subscriptions in the future.